Whether your little one is a bit laid back or is a whirlwind, you need to give her plenty of space and time to enjoy and learn through her life. At 19 months, she may be high on her energy level, keeping you on your toes all day long. Your mission would be to offer her plenty of opportunity to explore safe physical activities both indoor as well as outdoors. As a parent you must respect her individuality and not worry unnecessarily if her words are not blooming linguistically. The major development at this age is growth. Go through the following to know your 19 months baby development. 1. You may notice her dress looks shrunken these days or maybe she seems grown up after waking up one fine morning. You need to reassure yourself that this is true and not your imagination. 2. Your baby grows faster when asleep as the body releases growth hormones. 3. She is continuously consolidating memories and conserving energy, which constitutes a vital part of the growing up process. 4. Your baby’s growth is slower compared to the first 12 months and thus you need not worry about her weight gain patterns. 5. She will grow faster during the summer and spring and this pattern will get slower in the winter months. Thus her usual pattern of growth will be quite different from the previous year. The best words that describe your 19 month old are busy and active. The activities and interactions that happen in your 19 month baby development are as follows. She seems to be busy from the time of waking up. Thus you need to keep an eye on her and ensure she is completely safe. If there is any absence of sound or you have not seen her for long you can be assured she is up to some mischief! Even though your baby is independent at this stage, you need to help her get engaged in entertainment and play. Just when you feel your baby is growing up all too fast you need to remember that she is still very young. You may find your baby not interested in trying new or unfamiliar foods. It is common for babies of this age to refuse a food 6 to 7 times before accepting it. Your baby actually gets suspicious finding something new and that gets reflected when she is eating. You must limit the meal times to 30 minutes and the snacks to 10 minutes. Your baby may find it boring if you extend the meal times too long. Pushing away the plate, refusing to eat, saying no or trying to climb down the high stool means she is no more interested in eating. It is better to avoid in between snacks so that she feels hungry before another meal. If your baby is still dependent on breast milk mainly, she might develop anemia and her iron level may fall. This further reduces appetite. It is very important that you check with the health care professionals if she is getting adequate nutrition for growth. If your little one is suffering from constipation, make sure to offer her plenty of fluids. If you find her reluctant to drink, you can make her drink during the play times. 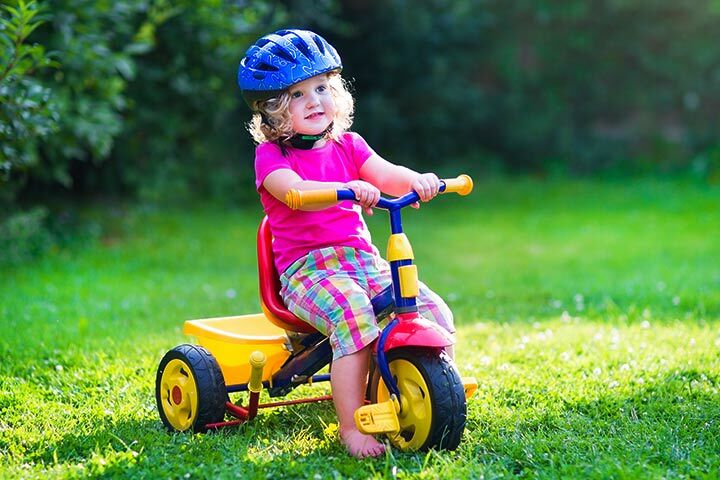 To help her coordinate her leg movements you can give her a tricycle to wheel around. This can also be a good physical activity that will help improve her appetite. If your baby has a dummy you need to think of stopping it. Dummies delay speech and also pacify her when she needs to be more vocal. Your baby receives emotional comfort from the dummies when it should come from you. Your baby’s toys must be age-appropriate. She will still have the habit of gnawing, sucking, chewing and biting whatever she gets. Your baby is a toddler now, which brings new challenges for you as well as your partner. Soon after her second birthday your baby shall start drawing corners, angles, and curves. These crucial changes shall indicate that she is attempting to draw pictures. Moms share with us your 19 month old developmental milestones in the comments section below. Previous Post: Is It Safe To Take Antidepressants While Breastfeeding? Next Post: Is It Safe To Take Painkillers While Breastfeeding?